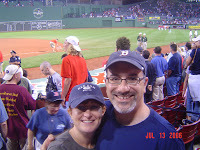 Home » Blog » Can We Pray That the Red Sox Win The World Series? Can We Pray That the Red Sox Win The World Series? A young student stopped me at services to ask if we could pray to God that the Yankees would win the World Series. Clearly this was a ridiculous question from an unschooled, theologically naïve youngster. I had to keep from laughing at him. Of course, had he phrased his question differently, say, “Could we pray to God that the Red Sox would win the World Series?”, now that would be a serious inquiry worthy of our time, attention, and theological consideration. Rabbi #1: Yes, But…: Dr. Jerome Groopman, in Anatomy of Hope, said it’s good to hope for a miracle but not to count on it. To me, prayer is often a way to bolster our inner strength, and to set eyes on the ideal moral behavior. When it comes to baseball or serious illness, prayer seems to be a way to help us keep going in the face of sometimes insurmountable difficulties. Rabbi #3: That’s Not Why Jews Pray: [This question points to] what is the purpose and function of prayer in Judaism. My answer is that Judaism is far more of an Eastern religion than a Western religion, which is why they call it the Middle East, and not the Middle West. Eastern prayer utilizes prayer as Mantra, as a means to change the one who prays, not to change the mind and actions of G-d. Prayer is used to focus, so that we can transcend that moment and that place. Jewish prayer is sing-song and lends itself to movement and davening (moving back and forth while praying). Jewish prayer is meditative in order to transcend. The only line in the siddur (prayerbook) that one is supposed to actually think about as one says it is the shema. All else is rote, and therefore lends itself to being meditation that transcends. But that is, IMHO (in my humble opinion), the purpose and function of prayer in Judaism. Western (read Christian) prayer is “gimme-gimme-gimme-now-now-now,” the expression of what we want, need, as if G-d cannot know without our asking. Magic is defined as when something is recited, like an incantation, like a magic word like Ev-ra-K’adabrah (I will create as I will speak), which becomes abracadabra, and which forces the gods, or G-d, to act according to our will, my will, and thus changes G-d, rather than changing my will. Prayers like the Mi Shehbayrach, are meant, again IMHO, to express a hope, to state something out loud and thereby gain strength from it, inspiration from it, and not to force the hand of G-d to do my will. Can G-d respond to my prayer by changing G-d’s will, and do what I ask? Of course, that is up to G-d. But that is not, IMHO, why we Jews pray. Rabbi #5: Maybe, But God May Answer “No”: … the theological answer may be simply to pray to God that each baseball player play to the fullest of his potential; that he treat the game and his opponents with dignity and respect; that nobody gets injured in the course of the game; that the umpires have vision to call plays correctly; that the players have strength to hit the balls well; that the players are filled with the spirit of determination to do the best they can. And, if in the end, your team loses, it isn’t because God cursed them, or because life is unfair, but simply because the other team played better that game, and reached its potential better that series. (Although, perhaps God does hate the Yankees these days. . .) In general, when people ask if God hears prayers, I sometimes give the answer that I think [Rabbi] Harold Kushner [author of When Bad Things Happen to Good People] has shared: “God hears our prayers; God just doesn’t always say yes.” This may be effective for someone who has a deep and abiding faith in general, and is going through tough times. I don’t use this theology on those whose faith and belief are shaky to begin with, especially with matters of life and death, which baseball, of course, is not. Rabbi #6: If You Pray That No One Is Injured: One night at services, the senior rabbi of my shul prayed for the Lakers to win. [A teenager] was so offended that he scheduled an appointment to speak to the rabbi. The God that he didn’t believe in, the teenager was sure, would not choose sides in a human endeavor of no moral import, and it trivialized the idea of God to ask God to do so. He would be OK with a prayer that no one be injured in the game and that both sides play their best, however. I think the original prayer had been somewhat jokingly offered, which more or less illustrates [the] point that it trivializes both the idea of God and the idea of prayer – no matter what team is involved! Rabbi #7: Prayer Is Not Magic! [Adapted from Rabbi Harold Schulweis on Is Prayer Magic? : …To convince people about prayer, show that it’s a winner. Blaise Pascal the 17th century philosopher understood the bettor’s mentality. He devised a wager that contended that it is smarter to pray than not to pray: If there is a God and you pray to Him [sic], you’re going to get something. If there is a God and you don’t pray to Him, you’re going to lose something. If there is no God and you pray to Him, what have you got to lose? And that’s not a bad argument for religious gamblers. It may explain why in certain circumstances people still do pray. Who knows what people on the death bed may calculate that after all to pray now, who knows, there really may be a God and if not, what have they got to lose? But when we are healthy and normal and things are going all right prayer seems to be a waste of time and energy…. …We want prayer to work. In fact, for most people prayer is closest to magic. Magic is practical. You want certain results and you want to be able to get it. To get results there are certain formulas, certain chants, certain incantations and that magic is going to be a shortcut to your desire. In magic you have to use certain words. You have to say open sesame and only then will the cave open. If you forget the right word and use another word the cave will not open. There is a formula to magic, a name to magic – abbr cadabbra is a word that has a magic of its own. According to some scholars abbr cadabbra can be traced to a form of gnosticism and the word abbr cadabbra is made up of three words. The first word is “aba” which means father, the second is “bar” which means son and the third is “ruach” for the holy spirit. This word was written over and over again on a parchment in various geometric forms and folded into a cross. Abbr cadabbra is a talisman hung on a string around the neck of an afflicted person. Magic is formulaic, it is a shortcut and it has power. The magician has power and he has the wisdom to know the secret word that will give him that power. Significantly in Judaism God is nameless. God has no name. The name of God is ineffable. One cannot pronounce His name (4 consonants – tetra grammatic). The reason for that is that if you know the name of God, you think you can control God, you can manipulate God, you can use the formula of His name for any purpose that you want. But the namelessness of God, the fact that throughout the Bible Moses tries to find out what God’s real name is and God avoids telling him what it is. He gives him an enigmatic answer like “I am that I am”. That illustrated the opposition, of Judaism to magic, sorcery, witchcraft, shortcuts to God. What has this digression to do with prayer? Everything. Magic is not prayer and prayer is not magic. In magic you are concerned with getting the end and you don’t care about the meaning or character of the means. Magic is impersonal. In prayer you have to be concerned with the means to achieve that end and those means that achieve the end invariably depend upon you, your attitude, your mind, heart and soul. You can’t pray for anything that you want. You can’t, for example, pray that this amputated limb should suddenly spring to life. You can pray for courage. You can pray for the acquisition of prosthetics. You can’t pray for things which violate the laws of logic or the laws of nature. You have to respect nature and nature’s laws. …In prayer you pray to move God. But the way you move God is through moving the divine in yourself. If you divide God from the image of the divinity within you, if you separate the two, then you speak about moving God without it affecting you at all. You ask “can I move God”? without asking whether you can move yourself. You ask “does God listen to prayer?” instead of asking “am I listening to my prayer?”. All your questions are directed toward somebody totally other than yourself. But the purpose of prayer is to activate the godly in and between ourselves. To put it more bluntly, we cannot pray for anything that doesn’t call on us to do something whether it’s in terms of our attitude, our will, our energy or our intelligence. You can’t pray for health however earnestly by expecting God to say yes or no. To pray for health means that you take seriously the means and meaning of health. You can’t properly pray to God for health with a cigarette in your mouth or a hot pastrami sandwich in your hand. You can’t pray to God for peace with folded arms, crossed legs, and unopened hands. As Rav puts it in the Talmud “man’s prayer is not accepted unless he puts his heart in his hands” (Taanit 8a). Prayer is meant to move you, otherwise you depend upon magical thinking. You cannot pray for peace and do nothing about it. You cannot pray that God should love the Jewish people without expressing your love for the Jewish people, nor pray for the rebuilding of Israel without personal involvement. Talk Back: What do you think? Do you think it is appropriate to pray to God that your favorite sports team will win? What do your husband/wife/partner, friend, parents, kids think? Tyler Howell, Age 11: No, I don’t think it’s appropriate to pray to God for your favorite team to win because God has really important things to worry about such as the war in Iraq and it’s better for God to focus on those types of things than helping a sports team to win. Besides, since God loves everybody, he couldn’t take sides in the World Series and the Dodgers aren’t in it!! Rabbi, since I am a fanatical Dodger fan, and love baseball, I think it’s perfectly normal and natural to pray to God that our favorite team will win, whether it be baseball,football, or whatever. I think praying in general is a good thing and as long as it doesn’t hurt anyone, I see no reason why it’s not OK to do it. When things are going well in our lives, we usually don’t feel the need to pray/ask God for anything. It seems then, that people most often turn to God when they are vulnerable, sick, afraid, etc. That is when we really want the “magic” and the immediate comfort and help. Through your words of inspiration (and thank you, btw,) I am starting to focus on remembering God when things are also going well in my life. I have never been one to pray for the trivial, like my favorite football team to win (and with the 49ers as my fav team…well, you get the picture;) but why can’t we express our thoughts or wishes for trivial things to God, if that is what is important to us? Why is God only reserved for “serious” one-on-one discussion? Is God just about healing the sick, guiding us through tough times or giving comfort and solace to mourners? Or is God more than that, or, in this case, even less than that? Thanks for your writings…you make me think about new ideas and how they impact my life. However as a 21st Century Reform Jew, I would say prayer is a deeply personal and communal choice. The prayer for a team to win or an event to take place doesn’t really fit into a complex and modern understanding of Reform Judaism. That said I would encourage a young person to think about what is the most important thing for a prayer and what is the main idea that he or she is trying to accomplish. As you said in your post it is about the intent of the prayer; it is better to pray for the safety of players not the win and that everyone can celebrate with joy at the wedding not that it doesn’t rain. Yet all of this assumes that prayer is heard by more than the one praying. In my personal opinion, petitionary prayers are ways to organize your life in a hierarchy of importance. The concept of God as an entity doesn’t work for me. The idea that God is just hanging out waiting for our prayers and/or to rule the world is a foreign concept to the modern world in which I live. A prayer asking for anything reminds me of the English reading that is recited on the High Holidays that says: “We pray for the end of hunger, but You have already given us the tools to feed the hungry. We pray for the end of war, but You have given us the means to make peace…” This statement speaks to me, it says that God isn’t responsible to heal the world, we humans—and if you were to read this more traditionally, Jews—are responsible for the world. The idea that we are created in an image of perfection, that is at the exact same time is flawed, speaks to a holiness that is deep, complex and troubled. The examples I find to be most telling are the stories of Noah, of Abraham fighting for Sodom and Gomorrah and of Jonah for good measure. The Noah story teaches that God didn’t have a direct hand in the actions of the people and that even though God created the entire earth, put people on it and made it “perfect,” God still needed Noah to make sure that people would continue after God destroyed the world. Noah, while a drunk and a general bum, was the first social activist. His job was REALLY the repair of the world. In the Abraham negotiations story, we see that God isn’t perfect; the vengeance side of the all loving deity can be dangerous and destructive. Avraham Avienu steps up here and takes a risk; he knows God instilled him with the power of reason, but not necessarily the power to withstand a lightning strike. Now Jonah. While most teachings I have heard about this story focus on the idea that Jonah’s actions prove that God is omnipresent and omniscient, I believe it shows that we are responsible for even the worst people on the planet. Each of these stories, clearly written by different people with different agendas, teaches us something about the intention of prayer. To paraphrase Louis Finkelstein, prayer is speaking to God, while study is the way God speaks to us. These stories tell me that God, the complete concept or even the individuals in the stories, listens and knows but isn’t all powerful. They also tell me, that God wants us to have a hand in making what we want and what we need happen. So prayer is simultaneously for the individual, the community, for God and for expected outcome, because in the end that is the point of the prayer: to better yourself, the community, praise God and get the best outcome. I’ll light a candle for them. There is still hope!